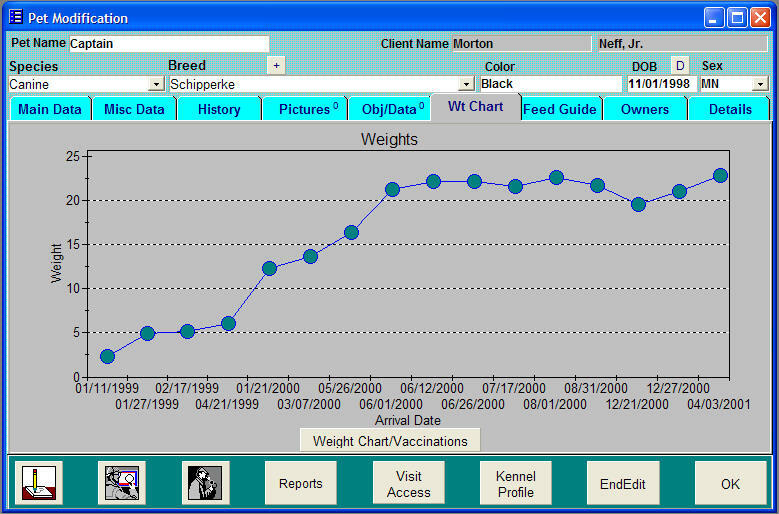 One of the most comprehensive pet record systems on the market today lets you modify a pet’s records, complete a history, add photos, maintain weight chart and monitor feed! Animal Alerts-When Mr. Jones brings in his toy poodle that always bites, the AHMS will alert that new doctor or receptionist as soon as the toy poodle is arrived, or when the visit is being accessed. The alert immediately appears, to warn the user of something critical with the animal they are examining. The Animal Alert can appear in 2 varieties: a basic alert, or a warning with larger, red lettering to communicate the severity of the alert. Enhanced Pictures-The AHMS allows storage of Photos and the setting of a default “Pet Photo” which is then printed automatically onto Invoices and Patient Sheets (used by practices transcending to “paperless”). A series of “Pet Photos” can be maintained, to track the history of the animal, and the desired photo can be selected with the click of the mouse. To simplify the storage of photos the AHMS now has buttons enabling you to store Photos two different ways: 1) Insert Photo- this allows the user to select a Photo image in a predetermined location and that image will be stored in the AHMS database directly. 2) Insert Small Photo- utilizes our digital processing module to manipulate the selected photo and reduce it to 320x240 pixels. The orientation remains the same, landscape and portrait dimensions are preserved as they are in the original. The location of the original photo is noted in the description field and can be easily located if required later in its full resolution if required. The original photo is also available to other applications as needed. Enhanced Radiograph Log-As digital radiography moves into the veterinary hospital, the AHMS evolves to make it easy to access the information you need. Our Radiograph log allows 2 ways to identify the films (numerical & alphanumeric), and 2 ways to store digital radiographs. With a picture field and our digital processing, you can store a “photograph” of the radiograph, as a quick reference image. Then a link to the actual digital radiograph (via our OLE field) can be stored, and when desired, the radiograph can be opened in it’s native application, directly from the AHMS. 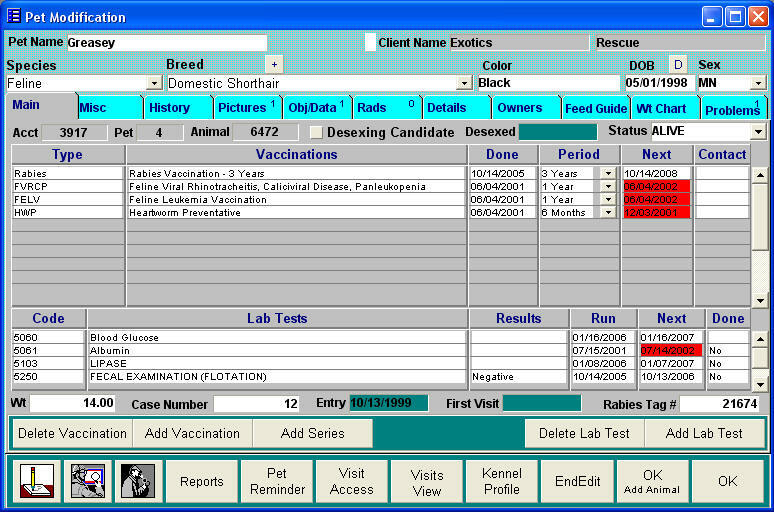 This Log can be accessed from the visit, from the clinical history, and from the Pet Record. Click Here to visit our New Website, and our new Name, ServiceVet Technologies! Please visit our New Website, and our new Name, ServiceVet Technologies! QuickVet Practice Manager adapts to your veterinary practice, fitting the flow of patients through your hospital and managing all their activities, needs and analysis. With our unique approach to training and implementation, we take the time to develop a plan that is ideal for your hospital and is under your control.